German philologist; born at Telgte, Westphalia, Dec. 25, 1831, his family being old Westphalian settlers. He was educated at the Jewish school of his native town, at the seminary and academy at Münster, and at the universities of Heidelberg, Berlin, and Paris (Ph.D., Berlin, 1864). In 1866 he became privat-docent, and in 1870 assistant professor, in the University of Heidelberg; and he is at present (1904) honorary professor of Sanskrit there. Lefmann has taken a great interest in Jewish communal affairs. While preparing himself for the university and during his employment as a public teacher he held also the positions of tutor and school-master in several small communities of Westphalia; and at Heidelberg in 1887 he was president of the Zedaka Verein, a society for the aid of the poor. Through his "Ueber Deutsche Rechtschreibung" (in "Virchow und Holzendorff's Wissenschaftliche Vorträge," 1871) and "Zur Deutschen Rechtschreibung" (in "Münchner Allgemeine Zeitung," 1871, Nos. 136, 209, 274) Lefmann took part in the movement for the establishment of a correct and uniform system of spelling in German. 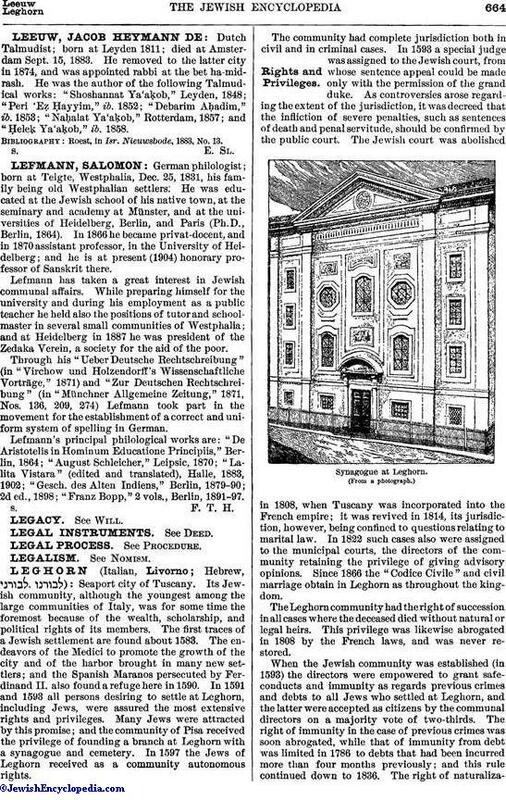 Lefmann's principal philological works are: "De Aristotelis in Hominum Educatione Principiis," Berlin, 1864; "August Schleicher," Leipsic, 1870; "Lalita Vistara" (edited and translated), Halle, 1883, 1902; "Gesch. des Alten Indiens," Berlin, 1879-90; 2d ed., 1898; "Franz Bopp," 2 vols., Berlin, 1891-97.